September 1986, Dallas, Texas, Pamela Ewing awakens from her slumbers. It’s been a somewhat horrific year, what with the cold-blooded murder of her husband and all that. But, hang on…Who is that emerging from the shower, greeting her jovially? Why it’s her spouse, Bobby, of course! The entire year has been nothing but a dream! Fast forward to October 2015, Judy Van Zant awakens from her slumbers. 1978 has been a somewhat horrific year, what with the tragic air crash which killed her husband and two bandmates and all that; hang on… I think you know where this is going, don’t you? Seriously though, if you think the old ‘Dallas‘ storyline was stretching the imagination, think again. 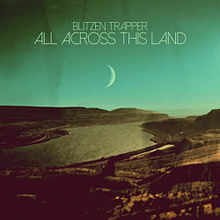 Listening to the title track that begins Blitzen Trapper‘s new album, if someone told you that the last 28 years had all been part of a terrible dream you had last night and that the crash never actually happened, you’d barely bat an eyelid. The swanky Southern groove is as authentic as sea salt and a terrific way to start. Even Lynyrd Skynyrd never sounded this much like Lynyrd Skynyrd. Much of All Across This Land is imbued with the spirit of 70s rock, the likes of ‘Nights Were Made For Love’ displaying a sweeping Springsteen like quality, whereas ‘Rock And Roll (Was Made For You)’ is like something Ted Leo, or perhaps even Tom Petty, would have written in their heyday, sounding the warning that “the things you love/They can do the most harm“. Seriously though, that sterling tune ends with a guitar solo worthy of Drive-By Truckers‘ Mike Cooley and is easily a high point here. Clearly Bob Dylan has been given extended reign on the Earley family turntable too, as his (chronically underrated) eighties incarnation is all over ‘Love Grow Cold’, and curtain closer ‘Across The River’ is the type of wordy epic so beloved of our folk anti-hero in his classic 60s meanderings. A smattering of fellow contemporaries Hiss Golden Messenger is identifiable here too. There’s a lot to love here on this, Blitzen Trapper’s eighth, yes eighth album, which reaches its zenith, for me anyway, with the gorgeous background strains of harmonica on the stunning ‘Let The Cards Fall’. ‘There’s a red moon on the water dear/You’d better run while you still can,” suggests Earley ominously; “Yeah I’ve been shaking hands with the devil/You know his fingers/They’re all made of sand.” There are many eminently quotable lyrics like running through the veins of the album, and it all adds up to a very pleasurable aural experience.